Only in Louisiana - documenting the adventures we call Life! : The case of the dueling "Rum cakes"
Ellen (who is named after her grandmother "Gran-E" and born on her birthday) has always LOVED the "rum cake" that Gran-E makes! It is one of her favorite desserts. Gran-E does make it for the other grandchildren and tones it down (doesn't pour straight rum and sugar syrup on top of it and let that sink into lots of holes in the cake) but my Ellen actually likes the real thing.......the more rum the better! For my birthday, Gran-E made me a "real rum" Rum cake and we all enjoyed it. On Monday, my Ellen started a camp at SLU and somehow got into a conversation with another little girl about "rum cake"....what else would 11 years olds be talking about at a camp????? They had a heated discussion about whose grandmother made the best rum cake. Anyway, last night, when everyone was fighting over the last of the Rum cake, Ellen said wait....leave one bite! Then she ran and got a plastic bag, carefully loaded the small bite that was left into it and labeled it as you see above. Not knowing about this Rum Cake discussion that had gone on at the camp, I asked Ellen "just what the heck she was doing!" 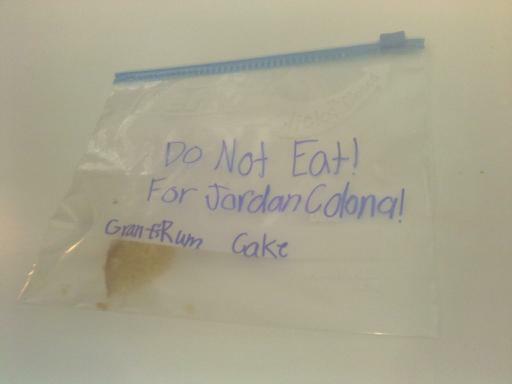 She explained that "Jordan" insisted that her grandmother made the best Rum Cake ever and being the "stubborn" little Gambel that my Ellen is, she was determined to prove her wrong! She took the "evidence" in today to prove her case......I haven't picked her up yet to see if she won the argument, but my bets are placed on her! WHO HAS THE BEST RUM CAKE??????? She informed me that Jordan wasn't there today so she couldn't resist and had to eat the evidence....in her own words...."It was too tempting"
I LOVE her!! Ellen is too cute. Great story- can't wait to hear the results! I picked her up and casually asked about it....she said "Well, Jordan wasn't there today.......so, I just ate it! I asked why she didn't keep the piece for Jordan to taste tomorrow and she said "It was too tempting!" Good ending to a good story! Case closed!!!! !